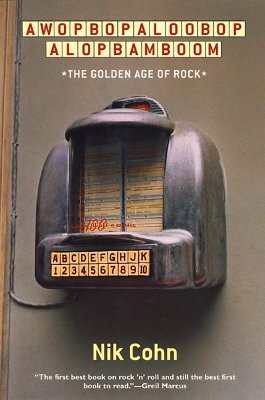 One of the books from the 2017 reading list that I have most been looking forward to reading (actually re-reading) is Nik Cohn’s now classic 1970 book on rock music, Awopbopaloobop Alopbamboom. Cohn’s style, which is opinionated, brash, and merciless in his assessments of some of the musicians we think of as both musical and cultural legends (don’t be fooled by the encomium above – he takes plenty of shots at the post-Army movie star and the Vegas period lounge singer Elvis became). He is, to me, one of the most authentic writers on the subject of rock music that I have ever read. I rate him with Peter Guralnick, Greil Marcus, and Lester Bangs (some would count Paul Morley in this elite company, but I find him pedantic and self-indulgent). Awopbopaloobop Alopbamboom is Cohn’s first book. Written when he was only 23, it is filled with the hubris and certainty of youth, and I suspect Cohn’s strong opinions, especially about his contemporaries, the rock stars who emerged in the 1960’s, have likely moderated – or hardened – over the years. Still, nearly 50 years later Cohn’s opinions about both the founding figures of rock from the 1950’s – Chuck Berry, Little Richard, Fats Domino, Elvis Presley – and the great English stars – The Beatles, The Rolling Stones, The Kinks, and The Who – almost all of whom he knew, some closely (he was an intimate of Pete Townshend) resonate with a level of both the gravitas of a serious critic and the snarkiness of a kid in the mosh pit that impresses even as it sometimes maddens a knowledgeable reader. He’s as authentic as those he writes about. A few examples serve to illustrate Cohn’s talent and his deep understanding of rock music. He is a fan of rock based in blues (despite his friendship with The Who’s Townshend, his favorite band, he tells us, is The Rolling Stones); he is dismissive of folk rock generally (he execrates pretty much everyone associated with it, even The Byrds and Buffalo Springfield, and expresses particular distaste for Crosby, Stills, and Nash); his critique of what he calls “California,” the West Coast groups from Los Angeles and San Francisco is alternately righteously angry (he is one of the first from the rock community to point out the mess that Haight Ashbury became as a cultural experiment) and exhibits his usual highly opinionated authoritativeness – Grateful Dead: simplistic noodlers; Jefferson Airplane: complicated noodlers; Doors: pretentious posers. As a writer, he was something like poet laureate to the whole rock movement. How do I rate him? Quite simply, I don’t – he bores me stiff. [The Rolling Stones] weren’t much on melody, their words were merely slogans…. All that counted was sound…. All din and mad atmosphere…. The words were lost and the song was lost. You were only left with chaos, beautiful anarchy. You drowned in noise…. Pete Townshend used to smash his guitar full in the amps, shattering it like kindling…. Roger Daltrey, who sang, used to swing his mike like a lariat and crash against the drums…Keith Moon used to play drums with twenty arms, mouth gaping and eyes bugged, flailing and thrashing like some dervish…John Entwistle used to play bass like Bill Wyman, bored as he could be, and he bound them down or else they’d have flown away…. Those boys have genius. They may be the ruin of us all. There’s not much way to argue with that kind if logic.